All registrations, whether, phone, fax, mail or walk-in, require a registration form and signed waiver with payment before you are enrolled in a program or trip. If you have any questions, please give us a call at 815-786-8044. The Sandwich Park District is committed to providing exceptional parks, programs, and events – and it all starts with outstanding staff. We offer a variety of full-time, part-time and seasonal jobs at various times throughout the year to operate our programs and parks. If you are a talented, energetic customer-focused individual, invest in your future now by joining our team of dedicated professionals. Our Team! Submit employment application and any additional information to the email address provided in the job posting. 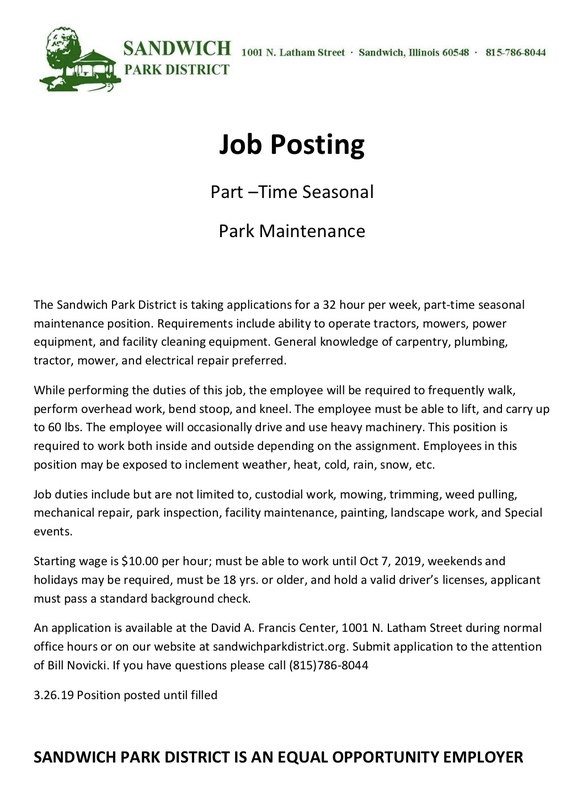 If not applying for an open position, send to sandwichparkdistrict. @comcast.net Please be aware that you will only be contacted for an interview if you are being considered for a specific position. All prospective Park District employees must successfully pass a criminal background check through the Illinois State Police as required by Illinois State law. If you apply for full-time employment with us, you may be required to successfully complete a pre-employment physical and drug screen. The Sandwich Park District is an Equal Opportunity Employer committed to a diverse workforce. All positions are governed by Park District Operating and Employment Policies and Procedures. All potential employees must successfully complete the required background checks as a condition of employment . Thank you Sponsors for your support!